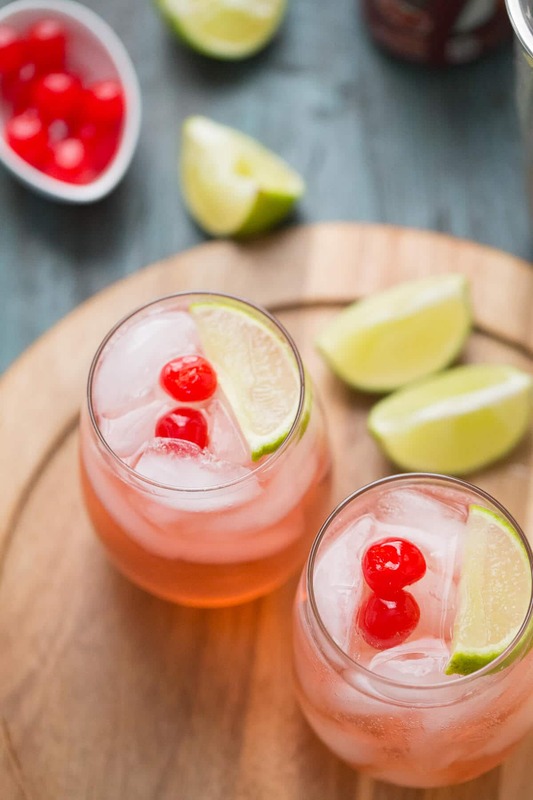 Cherry Sour Cocktail is a delicately hued drink that is lightly sweet and tangy. 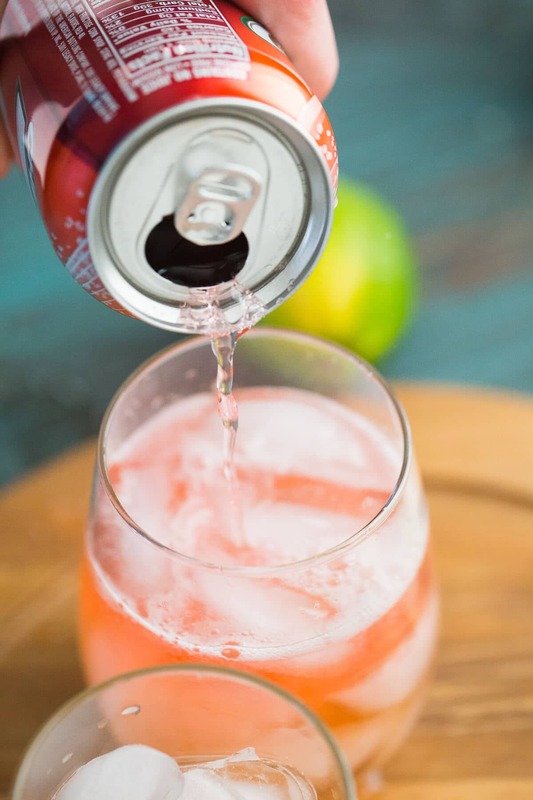 The cherry flavor is swirled together with sour mix and bubbly soda in such a tantalizing way. Everything about this cocktail is flirty and fun! 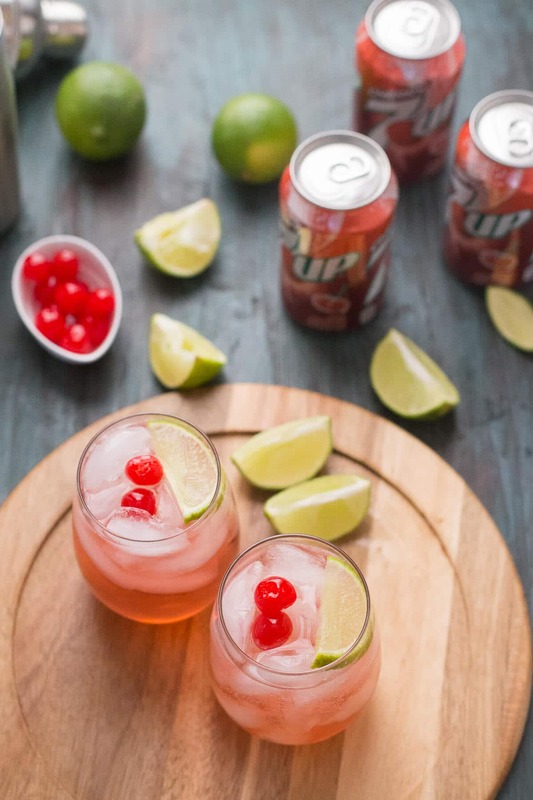 I am proud to have partnered with 7UP® to bring you this recipe. My first trip to Target after Christmas revealed a whole new section of Valentine’s Day candy and cards. I could not contain my excitement. While Christmas was wonderful, I was ready to move on. Since little happens in January aside from snow and cold weather, all the pinks and reds reminded me that there is a little something to look forward to in February. We get to celebrate Valentine’s Day! I spent a few moments circling around the heart-shaped boxes of chocolates and treats, thinking about what sort of things my family would enjoy, but since it was a little too early to commit to a purchase I moved on. I didn’t get far before I knew exactly what I needed for Valentines’ Day. I need cocktails. And I need to sample them NOW. My husband and I do not do a lot for Valentine’s Day. There was a time we would plan a romantic meal or make reservations for an intimate table at an overpriced, yet trendy restaurant. As time has gone by, we realized it’s ok if we don’t do much. Just spending time together, talking over drinks is a much better way to celebrate the day. Target’s soda aisle gave me my key ingredients to make the loveliest cocktail that will be perfect for every day of the year, not just Cupids day. I quickly spied pink cans of cherry flavored 7UP® and it set my gears into motion. 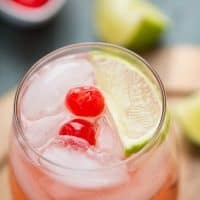 If I grabbed a bottle of sour mix and maybe a few limes and maraschino cherries I could mix them with a few spirits from home to create the ultimate Cherry Sour Cocktail. Forget the chocolates, this will be way better. I’ll bake with maraschino cherries, especially this time of year as I’ve done with these double chocolate chip cookies and these cherry lime cookies. And certainly, they are the perfect garnish for all sorts of cocktails like this Bourbon Daisy and this Whiskey Sour Party Punch. They add a pop of color and a light touch of sweetness. 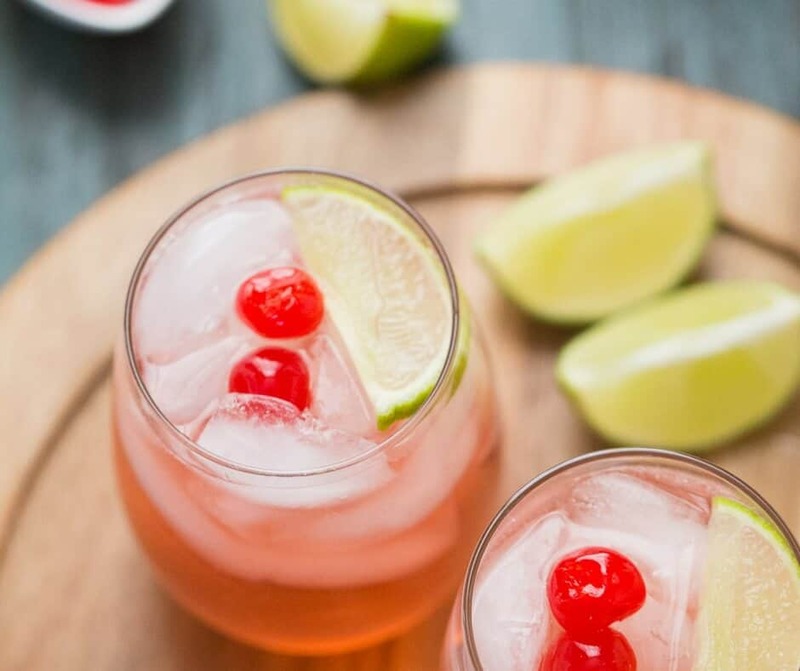 They are simply for garnish in this cherry sour cocktail, they give your eyes a little hint as to what flavors are hidden inside each glass. I added more sour mix; to my shaker, the tartness is playful and tastes so good paired with the vodka, the raspberry liqueur, and the bubbly Cherry 7UP. A splash of fresh lime juice brightens and emboldens all the flavors. 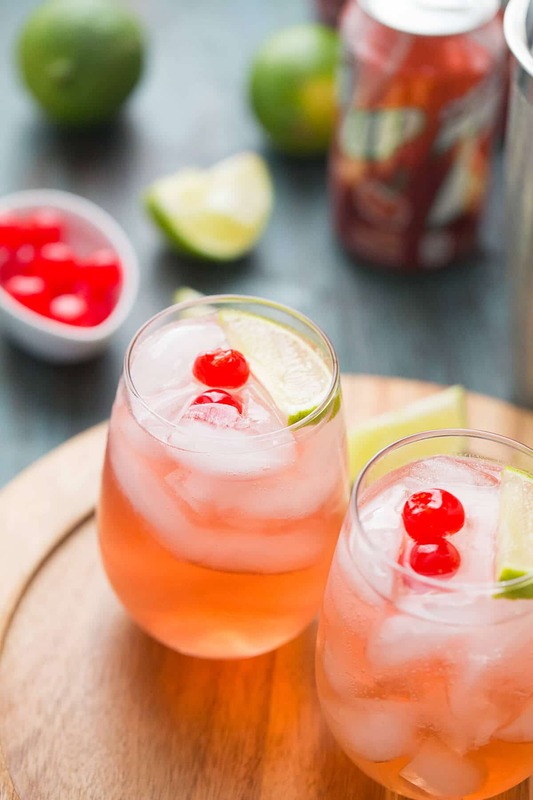 My husband will eagerly sip this Cherry Sour Cocktail with me on Valentine’s Day, and he’ll enjoy a glass or two before Valentine’s Day because this drink is so good, I know I won’t be able to wait that long to enjoy it again! Pour cocktail into two glasses filled with ice. 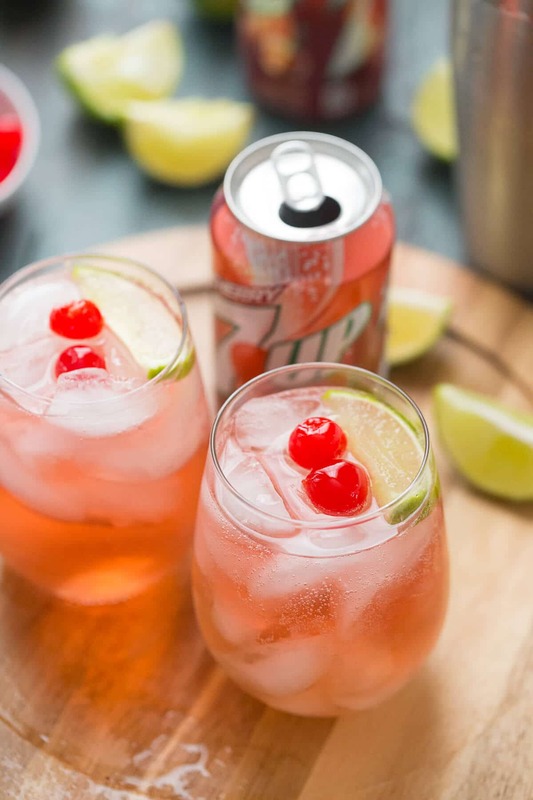 Top each with cherry 7UP. 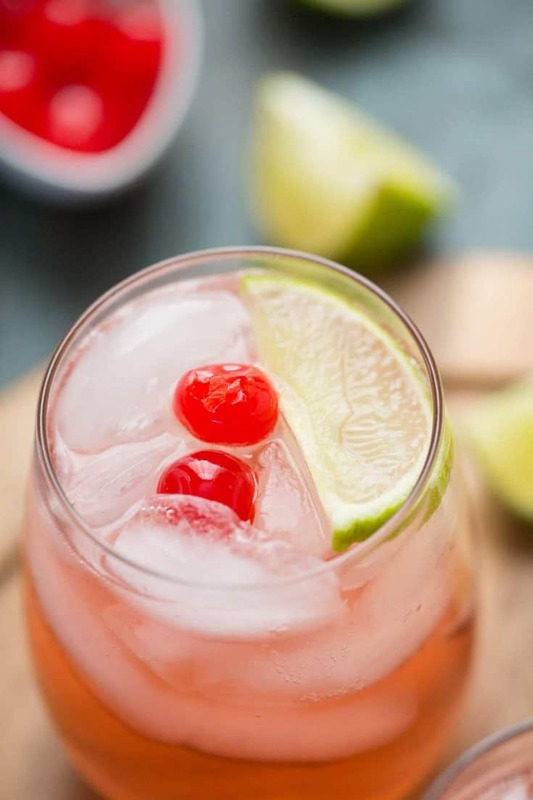 Garnish with maraschino cherries and lime slices. Mix two parts fresh lemon juice with one part simple syrup. How to make simple syrup? It really is simple: One part water to one part hot water. Stir until dissolved. I replaced Chambord with with Grenadine and it was spot on for this recipe! I LOVE that idea, I will have to try that!